TiTANplatform, a global smart content and device company, has announced a strategic partnership with China Unicom to provide smart content and device localization solutions.China Unicom, one of the three major mobile carriers in China, will manage sales and marketing of TiTANplatform’s content services and smart devices in China. Under the agreement, the two companies will establish strategic partnerships in the areas of internet services, telecommunications and technology, expanding their global businesses in Korea and China. 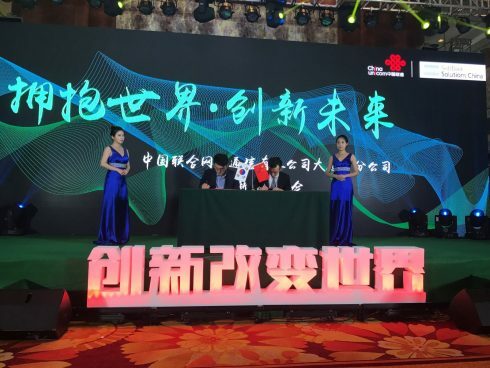 In support of this partner agreement and its Chinese business operations, TiTANplatform recently opened a headquarters office in Dalian, China. TiTANplatform has corporate headquarters in South Korea with individual territory offices in the U.S., Singapore and China. TiTANplatform will be providing content via TiTAN Play™, a transactional and encrypted smart content platform, which powers TiTAN Core™, all-in-one smart entertainment and connected home devices. “TiTANplatform looks forward to providing core platform technologies, including data centers, cloud platforms, Internet of Things (IoT), Artificial Intelligence (AI) and Big Data solutions based on our TCI encryption, to expand upon China Unicom’s advanced telecommunication services,” said Jae Young Yoon, TiTANplatform Chairman. “This ground-breaking agreement sets an example for telecom carriers worldwide and creates vast distribution opportunities for US premium content creators and owners,” said Adrian Sexton, TiTAN Platform US CEO. “As strategic partners, we will benefit from our broad ICT (Information and Communication Technology) reach together with the superior technology of the TiTAN platform,” said Tan Tai Yong, Vice President, China Unicom. China Unicom is a world-leading telecom operator in terms of revenue and customer base, ranking as one of the premier companies in the Fortune Global 500. Listed on the stock exchanges of New York, Hong Kong, and Shanghai, the company has 31 branches in mainland China and 5 overseas subsidiaries around the world. China Unicom offers both fixed and mobile telecom services for customers via an extensive last mile, long haul and international network. China Unicom owns state-of-the-art telecom networks, providing high quality integrated broadband communication and information services. For more information, visit: http://www.chinaunicom.com/.